OCC's RTS18 is a robust rack mount fiber enclosure designed for high density applications that mandate rear coupler access. The Sliding tray design is ideal for easy installations and quick terminations. The RTS18 accommodates 18 ports using standard 6 port adapter plates into a 1 RU footprint, but can achieve higher densities with 8- and 12-port adapter plates. 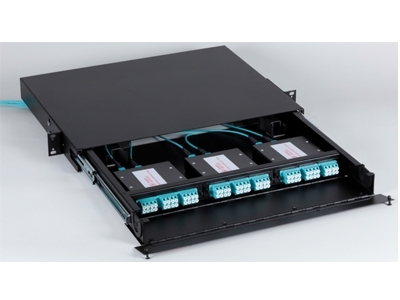 Each Cabinet is build to be a strong, durable, high-density, patch and splice solution for fiber optic networking.